While Tovrea's operation proved to be a post-World War II headache for city boosters due to its proximity to Sky Harbor, the odiferous enterprise first disrupted the ambitious plans of would-be hotelier and neighboring landowner Alessio Carraro. 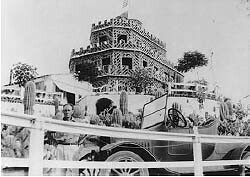 Facing financial hardship and the daunting prospect of operating a successful resort next to a working feedlot, the Italian immigrant sold his hilltop structure now known as Tovrea Castle to the cattle magnate in 1931. Image courtesy City of Phoenix Parks and Recreation.